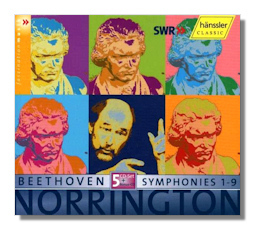 Two recent live recordings of Beethoven's symphonies claim attention. Sir Roger Norrington's concerts and discs are coupled chronologically, and his interpretations are the more didactic, with his concert talks included. A believer in Beethoven's controversial metronome markings, the tempi are swift and the delivery often brusque, running to the brutal. Chief Conductor of the Stuttgart Radio Orchestra, he applies his period instrument discoveries to modern symphony orchestras. The Stuttgart musicians respond with unflagging energy in a way which keeps you listening, thinking and wondering. The Stuttgart strings have been schooled to use less vibrato than is the norm, resulting in a convincingly 'period' feel. Norrington's line-up is mainly modern, with some period wind instruments and valveless brass. That mixture had me worried quite often in the balance, which as recorded favoured often raucous brass, to the particular disadvantage of the dulcet flutes, which are sometimes barely audible. Nothing serious is lost by these being live performances. Peter Maag, who died in 2001, was a fine Swiss conductor who worked mostly with relatively unfamiliar orchestras in Italy & Spain. He is known through a few recordings of Mozart & Mendelssohn with the London Symphony and more recently made live recordings of Mozart, Mendelssohn, Schumann and Gluck for ARTS. These, his only recordings of Beethoven's symphonies, were taken from concerts with the small Venice-based Orchestra of Padova e del Veneto, truer to the size of Beethoven's own orchestras. Maag does not seek an 'authentic' sound, towards which Norrington strives. The winds are far more forward and prominent than is the case with the large symphony orchestras. I like this and, especially, the feeling of naturalness and 'rightness' that Maag brings to most of his work. The playing and recorded sound are, to my ears, perfectly satisfactory and suggests long familiarity before the interpretations were entrusted to disc. Well worth exploring. 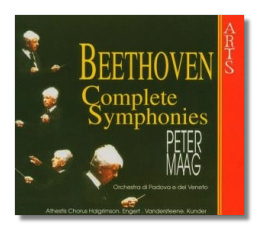 Excerpts of Maag's Beethoven can be heard on the Amazon USa website, together with several contrasting published reviews of this set, which will probably give purchasers more lasting satisfaction than Sir Roger's latest.